subconjuntival abscess is a relatively rare pathological condition of eye. It usually occurs in eyes associated with predisposing factors of previous trauma (or) surgery. Nearly 5 Jersey & HF cross calves with projecting sub conjunctival nodules either in upper (or) lower eyelids were brought to veterinary dispensary. All the calves were around 10 months to 1 year of age group with no history of trauma/surgery. 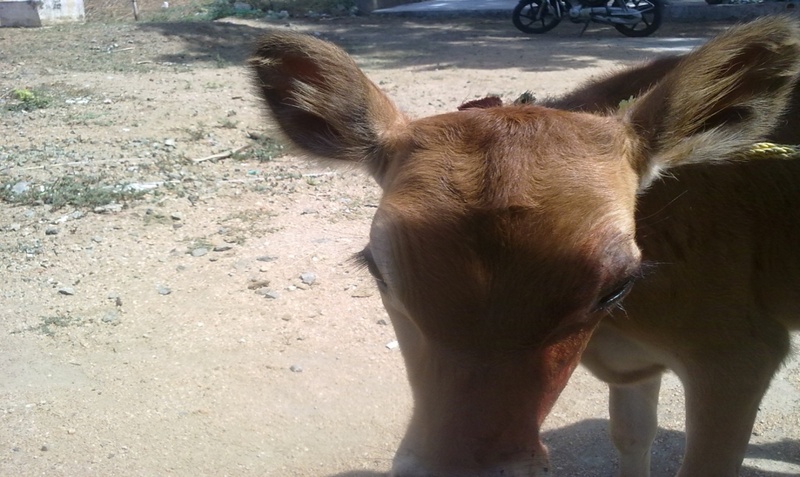 This sub conjuntival abscess might be due to direct infection (or) self inoculation from any part of the body infected with bacterial agents such as Morexalla,Mycoplasma,Streptococuss & Corynebacterium. 1) First day as a conservative treatment 1Ml of Prednisolone was given intra conjunctivally - No reduction in size of the nodule after treatment. 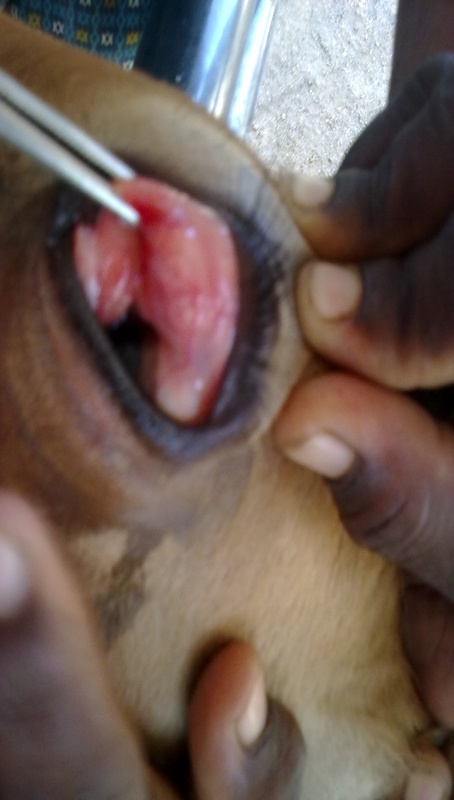 2) In this circumstance local infiltration anesthesia with 2% Lignocane was done . 3) Then the ptergium was excised by pulling the nodule with forceps to avoid any damage to the underlying structures (while doing incision). 4) An elliptical incision was made around the nodule –semi inspissated yellowish pus was oozed out from the excised nodule. 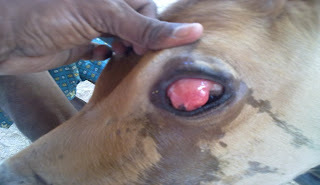 5)Then the eye was thoroughly washed with normal saline & the bleeding was arrested by placing cotton tymponad in the eye. 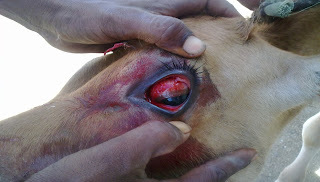 6) Later,the animal was not placed on intensive systemic treatment eventhough the eye is a delicate & more sensitive organ. Only the Pendistrin –SH was applied locally –TID. Apart from the above treatment the following treatment was also done. Bol.Melonex –p-1/2 bolus/day Bid for 3 days. The wound healed well,thereafter no recurrence & visual impairment was observed. 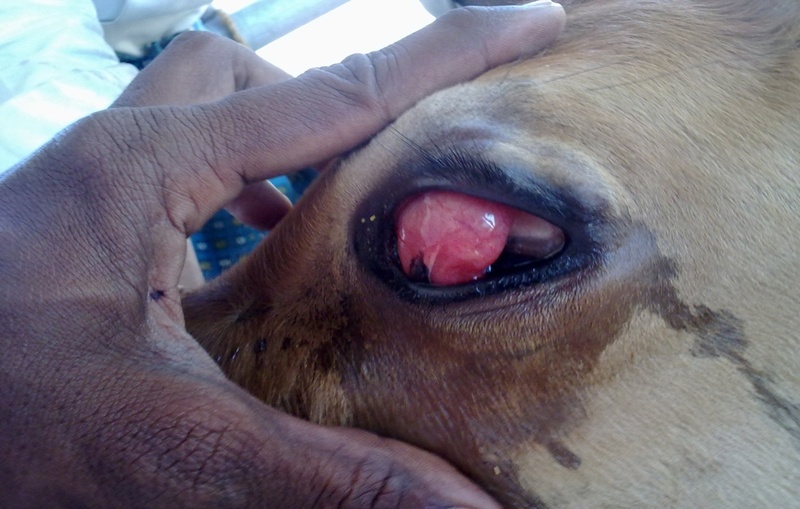 The abscess in the upper conjunctiva..
S.Melapatti, Madurai Dt – 625 703.